Whenever I have to eat alone (and I do hate eating alone), there are several "go-to" types of restaurants. These mostly include small Asian joints specializing in Ramen, Pho or Wonton Noodles. Sometimes all 3 in one place, but we all know that's not the way to go! There are several reasons why I choose these restaurants - price, simple menus and no one really cares you are taking a picture of your noodles. Well, generally most people won't care, but some will stare. What's wrong with a person taking a picture of their wontons? Anyways, I was passing through New West and needed to grab a quite bite. I noticed that Le Saigonnais had replaced Royal City Thai (which had previously replaced Royal City Cafe where the sign still exists). As I walked into the place, I was happy they kept the high-back booths since it would help "hide" my obsessive picture-taking. I proceeded to order their lunch special which included a choice of Pho and a Spring Roll. Okay, I know I'm nit-picking here, but for an "Authentic" Vietnamese restaurant (as they claim), would it be too hard to use rice paper w rapper? In actuality, I don't really mind the wheat wrapper, but it just seems like such a small thing to get right. 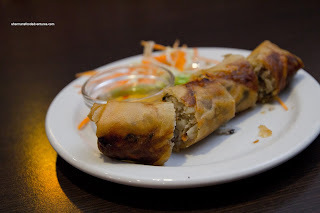 The spring roll was fried crispy with a slightly different filling which included julienned rutabaga. This added a crunch which I didn't mind. The rest of the filling was moist and a bit loose with a definite hit of fish sauce. As always, I went for the Pho Dac Biet which featured al dente noodles and plenty of tender meats. Again, I was a little irked at the use of a lemon wedge rather than using lime (maybe they couldn't find any limes? I'll give them the benefit of the doubt). 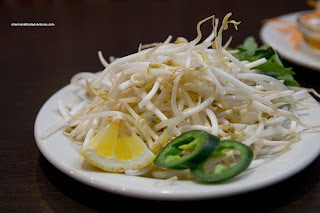 The first thing I noticed about the broth was the apparent hit of daikon. Moreover, there must've been a healthy dose of MSG because it was pretty flavourful and sweet (in not a natural way). 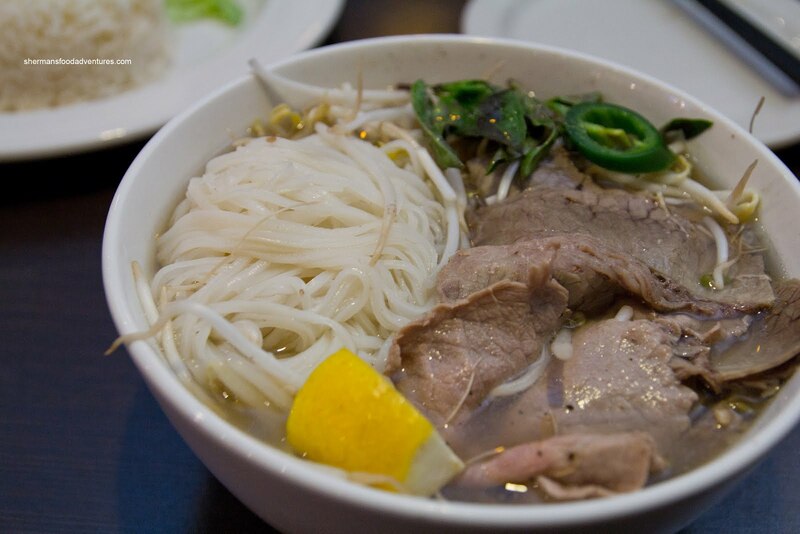 Decent Pho though. Of course I had to add a Lemongrass Chicken with Rice just for some diversity. The rice was chewy and nicely prepared while the moist chicken was adequately charred. 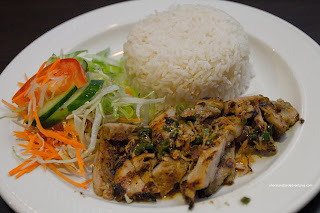 There was a decent lemongrass hit with the properly seasoned chicken. Personally, I'm not a huge fan of the chicken being pre-sliced. It tends to dry out. In general, the meal was not bad and the booths were quite comfortable. 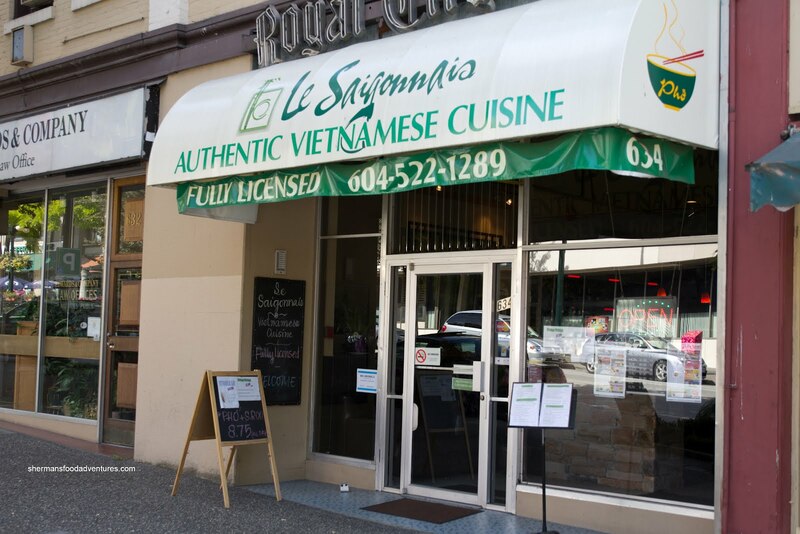 Le Saigonnaise is just another one of the many Vietnamese restaurants in town which serve up standard eats.